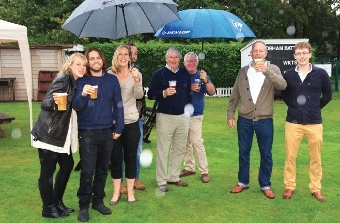 THE much-anticipated Chobham Cricket Club Village Day went ahead on Monday despite terrible weather that started Sunday night and persisted all day. Proceedings should have kicked off at 10am with a Junior Match which was to be followed by the Chairman’s XI batting against a Chobham Invitation XI. But the heavens wouldn’t allow it so resourceful hosts turned their attention to the bar and some hastily constructed but highly effective marquees. The precipitation could not stop all play as the healthy turnout of 150-plus guests sought comfort beneath canvas. While this was of course a cricket-driven event, the matches were never intended to be the be-all and end-all, as a barbeque, bouncy castle and afternoon teas featured high on the agenda. As indeed did the Summer Party from 5pm, a mouthwatering hogroast laid on by meat specialists Lewis of Sunningdale, tasty summer puddings, a welcome flow of real ales, and cracking live music from father-and-son duo NRG, who wowed the crowd with their special brand of rhythm and blues. Club Marketing and Fundraising Official Mel Keenan was rushed off his feet, not least because of the many last-minute changes he had to make. This season has seen the club raise a lot of money, which is much needed because they are restructuring their training and integration of junior and senior players.